A new pool player asked me during a lesson how to be considerate at the pool table to her opponents. She did not want to commit any acts that were considered improper. It occurred to me to write an article on proper pool etiquette. I believe it is important to the image and growth of pool that all players do their best to be polite to opponents and exhibit good manners as role models to new and young players taking up the game. 1. Greet your opponent and introduce yourself if you don’t already know her. I always wish her luck, but “Play well.” is a fine substitute for the superstitious. After the match, win or lose, shake hands and thank her for the match. Try to remember that the way you handle winning or losing might be the way some other player will behave toward you some day. Handle both with grace and dignity and you’ll earn a reputation as a respectful player who also deserves to be treated with dignity. 2. Be very quiet while your opponent is lined up on a shot preparing to pull the trigger on a shot. Crack open your can of soda while she is walking around the table or chalking her cue. Likewise, don’t shout across the room to say hello to a friend when your opponent is shooting. 3. If you are not shooting, it is best to have a seat in a chair. The establishment should have sufficient seating for you and your opponent to each have a chair and table where you can rest your cue, set your cue case, drink and cell phone (which should be on silent or very soft ring depending on the situation). It is customary in serious matches to walk to your seat as soon as you miss or play a safety. You’ve completed your turn and should clear the area to allow your opponent to the table. Don’t grab the chalk. You won’t need it until your next turn and your opponent will likely chalk. 4. If you must stand, be still and discrete. In casual or fast paced games where you’ll shoot very frequently it is acceptable to remain standing near the table, but not in the direct line of sight of your opponent’s shot. For example, if you are in a safety battle in one pocket where you and your opponent are trading shots rapidly, it may be pointless to return to your seat after every shot, especially if your pocket is on the other side of the table. In this case, it is fine to stay standing on that side of the table, but please make an effort to take a couple of steps back and try to blend into the background. 5. If you are standing or seated and the player must shoot toward you, remain as still as you can. Make no sudden movements and don’t visit with a nearby observer. If your location is somewhat close to the pool table and you see that your opponent will probably shoot looking directly toward you, move 6 or 8 feet away before she bends down to address the cue ball. Do this only if you have time to move aside before she starts to bend down to shoot. If you are too late, just try to hold extremely still. 6. Spectators: If you have to walk by a pool table, try to time your trip between shots. If the layout of the pool room is such that you have no choice but to walk by several tables, do it quickly, smoothly, and quietly. There are mixed feelings about this, but I’d rather see a person just walk by in one motion than stutter-step through a bunch of pool tables. These days, most players are used to a certain amount of background noise and motion. It can be more distracting to see a person come to an abrupt halt in your peripheral vision while shooting than to have them keep walking smoothly past the end of the pool table. I understand that people are trying to be respectful by stopping, but if I am bothered by their walking by, I’ll simply take a couple of more warm up strokes until they pass by, or stand up, re-chalk and resume shooting. This movement applies only to spectators, never my opponents. They should either be seated or standing motionless outside my line of sight. 7. In a tournament setting, be on time for your match and keep an ear out for your name when the tournament director announces matches. Tournaments can be difficult to keep on schedule if players don’t arrive at the table soon after their match is called. Likewise, when the match is completed, tell the tournament director the results so he can call the next match on your table. 8. Respect the game, opponent, and equipment. Tempers flare but maintain your composure. Don’t thwack the table with your cue or dump the balls out of the ball tray when you get a table. The equipment has enough wear and tear through the course of regular play. Help it stay in good shape by refraining from unnecessary harsh use. Place cubes of chalk with the blue side up. Chalk dust spills off the cube when it is set on the rail upside down or lying on its side. This chalk ends up in the cloth, on players’ clothes and hands and eventually embedded in their shafts. Chalk dust can reduce the life of the cloth and contribute to the maintenance and upkeep of the tables, balls, and cue sticks. Chalk your cue tip while holding it over the floor, not over the playing surface. This will keep the fallout from getting into the cloth. While warming up on a table, never shoot object balls with your cue tip. The chalk grinds into the object balls and may cause the cue ball to throw off a well struck shot with the phenomenon of ‘skid.’ Keep the equipment clean and it will reward you with consistent and predictable play. I play a friend who, when I call a shot, has a habit of approaching the table to see if the shot can be made or checks my line up. I find this very distracting, but he says it’s ok to do this. Your friend is doing the pool equivalent of what the kids at Bushwood Country Club do in the film “Caddyshack.” He probably doesn’t yell “Noonan” or “Miss it” but his body language could be interpreted as such. I suggest having an informal chat — he probably doesn’t know the polite thing to do. Honestly, I give most new players a break and I assume they do it out of curiosity or for a chance to learn how I’m playing a shot. Nobody in pool is born knowing all the rules and etiquette. It is our responsibility as players who know to educate others in a caring and thoughtful manner. If you think that’s coming on a bit strong, I will tell you that with a friendly smile and helping attitude I’ve asked dozens of complete strangers not to sit on the pool table. (It can be the main cause of the cushion rubber becoming unglued to the wood rail resulting in a DEAD cushion!) Most of the time the strangers apologize to me and thank me for explaining the effect. Nobody likes to hear that dreaded SQUISH when the cue ball or banked ball hits the dead zone. I go on to explain that occasionally there will be a shot when you or I would like to have a closer look to see if we should find a referee to watch the shot or discuss what shot is being played. In those cases, I ask my opponent if he or she thinks it will be close. If I know it will, I’ll ask if I can take a quick look. These actions are just fine and they come up very rarely. As a courtesy when I’m at the table and I think the next shot looks questionable or close, I’ll ask my seated opponent if they’d like to have a look or call a ref. Furthermore, I always call a foul on myself when I’ve made a bad hit, double hit, disturbed a couple of object balls, or other infraction and hand the cue ball to my opponent. This is honor system behavior is etiquette at its highest level and is what could help elevate pool to the truly elite image sports such as golf. Players on the Professional Golfers Association routinely impose penalty strokes on themselves and recently a player forfeited his prize money mere days after the tournament for signing an inaccurate score card. Think of etiquette in golf as good example of what it should be in pool. I remember being scolded as a boy for running on the green and stepping on another players putting line by my father. Even though I was very light and wouldn’t dent the green with my footfalls and I was in sneakers rather than golf spikes, I was told the effect it could have on a rolling ball and thus poor sportsmanship, distracting, and potentially damaging. In other words, poor etiquette. Dad made me apologize to our playing partners and they accepted graciously and we had a terrific time the rest of the afternoon. If you know pleasant behavior in the pool room, share it generously. It’s our duty as veteran players to pay it forward. And always remember, you too were once a beginner player with low ability and knowledge of how to be a good sport. Treat the beginners as you would have liked to be treated when you took up the great game of pool. Wow! Came here to learn about pool etiquette and learned something about golf too! That’s another activity that I have taken up since retiring. I am very much a novice at both. Thanks! 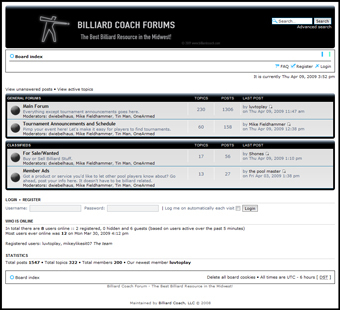 © 2007 Billiard Coach – Mike Fieldhammer. All Rights Reserved.